Horst Schwesinger: Not to bad, Mr. Apratim. Everything is fine. We have upto now, we had a good show and we are quite happy with what we have started upto now. What makes IWF a must visit for Barberan? Horst Schwesinger: Well IWF, especially Atlanta is for us the most important show in the US. There is another one in Las Vegas, but I would say from customer visits’ point, it is not as interesting for us as Atlanta. Atlanta for us is the American Ligna, let’s put it like that. We have Ligna show in Europe and then we have Atlanta here in the US because all the South American customers, Canadian customers, US customers are coming here and we have quite good response from the people. Well that is a very big customer’s feedback for the show.Tell me more about your presence in North America and your demand. Horst Schwesinger: Well, we are present in North America for more that 30 years, but let’s say also, I would say, times have changed. In the past we were selling other machines mainly than today. Barberan’s strenghth in the past was only laquering machines and some laminating machines and wrapping machines. Nowadays, we have another impact on the market, which is from digital printing. So, the digital printing is taking step by step. It is taking ground on the market. We have a good reputation, we have a couple of machines in the woodworking industry and also in the corrugated industry in the US and worldwide, but US is quite an important market for us. And I think in the future, there will be more update, small speech and then digital printing symposium at the beginning of the show one day beforehand and we were thinking during this show, due to the responses as well, that we might maybe bring a digital printer for the next IWF Atlanta as well. That is what we are thinking about at the moment. Well, that’s nice. Tell me the main features of the Jetmaster TXT. 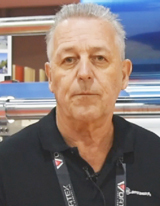 Horst Schwesinger: Well, the main features of Jetmaster is that it is a single pass machine. We can do four colours, we can do six colours. We have very special features on the colour management and on the for eg. transportation system and the projection system of our ink and I think we have a special feature, a very good technical arguments to be one of the leaders of the market. As we know you are one of the leaders of the market in hot coating technology, tell me more about your hot coating digital printing for line for flooring. Horst Schwesinger: Hot coating actually started with High Gloss Lines for the furniture industry. So, there are several lines for High Gloss, for eg. on melamine faceboards, that is mostly for panel produces, but in combination with the digital printing, we have another market niche at the moment because we could go on flooring and then Kleiberit, together with Barberan have developed the system for a special hot coating material which is not High Gloss, but it is a corungium based PUR product in order to increase the abrasion or the resistence of the floor. So, we can go upto ac3, ac4, ac5 resistence with this hot coating and what we could do basically, we could start doing a base coat of the panel. We prepare a panel, we digitally print it and on top of that, we place a hot coating anti scratch material and that gives a very good feature and a very interesting prospect for the flooring industry. Well, what we can expect more in 2018? Horst Schwesinger:In 2018 I think we have to expect that we get our orders ready because the order books are quite full, not only with us, but also with other companies. So I think 2018 basically is over as where as novelties are concerned, but there will be quite a good couple of things next year as well and in 2020. As you mentioned about next year, the Mexican Show which is starting in the middle of January, will you be there? Will you be participating in the Mexican Show? Horst Schwesinger: I do not know personally, but we always make a plan for the next year. So, I guess you can see that on our website. We also do by normally September-October every year we make a planning for next year. Then we talk internally and then we decide the budget for next year’s exhibitions. that depends always on the success of the previous exhibition. We discuss that with the different reps we have, with the people inside Barberan, with the owner of the company and then we decide where we go. You can see that on the website.